The South Bend (Ind.) Community School Corp. will install 192 stop-arm cameras on its buses. Photo courtesy South Bend Community School Corp.
SOUTH BEND, Ind. — A school district here approved funding on Monday to install stop-arm cameras on its school buses. The South Bend Community School Corp. board, at their meeting, unanimously approved the purchase of 192 camera systems that will cost approximately $456,504, according to WNDU. Each bus will be equipped with two stop-arm cameras and three 360-degree cameras around the bus to record the license plate of stop-arm violators, the news source reports. 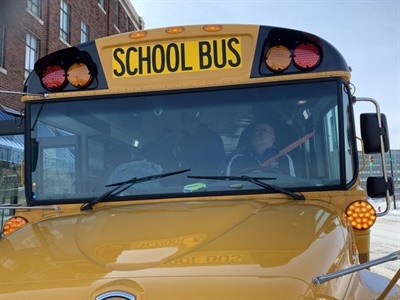 The cameras are expected to be installed on all of the district’s buses by the beginning of the 2019-20 school year, according to the news source. The district's decision to install the cameras comes after the fatal school bus crash in Rochester, Indiana, in October that killed three students and seriously injured one other. As SBF previously reported, the motorist told investigators that she didn't see the bus, which had its lights flashing and stop-arm extended, or the students until it was too late. She was charged with three counts of reckless homicide and a misdemeanor count for passing a school bus with the stop arm extended, causing injury.